The Egypt Football Association (EFA) are set to chose between Milovan Rajevac and former USA boss Bob Bradley to be the Pharaoh's new coach. The EFA cut their shortlist from four to two on Wednesday - Serbian Zoran Filipovic and Francisco Maturana of Colombia are the men to miss out. 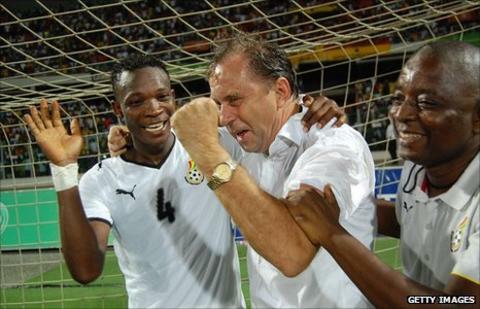 Former Ghana coach Rajevac arrived in Cairo on Monday for talks with the EFA. Rajevac led Ghana to the quarter-finals of the World Cup in South Africa and the 2010 Africa Cup of Nations final. He left the job after refusing an extended contract and went to a club Saudi Arabia, before taking over as Qatar national team coach - a job he lost last month. The EFA are looking to replace Hassan Shehata, who stepped down earlier this year. The Pharaohs' Olympic coach Hani Ramzy took charge of a mainly youth-based squad for the weekend's 2012 Africa Cup of Nations qualifier in Sierra Leone. The 2-1 defeat confirmed that Egypt would not be able to qualify for the finals in Equatorial Guinea and Gabon. Meanwhile the EFA refused to accept the resignation of vice-president Hani Abu Rida, who is also on the Fifa executive committee.